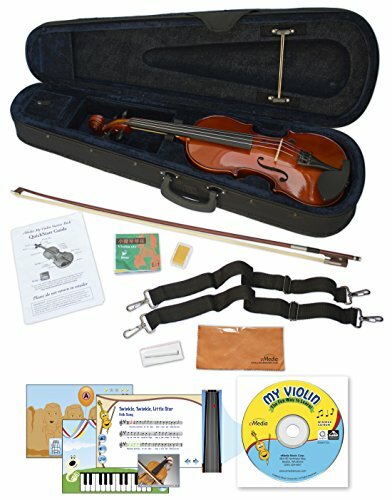 The eMedia My Violin interactive educational software is what sets this 1/4-size violin pack apart from all the others. An animated character named Val the Violin guides students through over 160 lessons, teaching them the core elements of violin playing. Authored and demonstrated by professional violinist Sabina Skalar, M.M., the method is great for beginners of any age. (a $49.95 retail value if purchased separately). eMedia My Violin teaches with the help of videos and live recordings of songs. An animated fingerboard shows correct placement for fingers as the music plays, and MIDI tracks let you adjust the speed. My Violin’s revolutionary new Finger Tracker actually listens to your violin playing and shows whether your fingers are placed correctly, and how to adjust them. Colorful MIDI accompaniments make practicing fun. Additional valuable software tools such as an automatic tuner, metronome and digital recorder are also included. eMedia My Violin first covers such basics as proper violin, hand and finger position, the elements of correct bowing technique, how to tune the instrument, and play rhythmic tunes. It continues on with popular songs and an introduction to reading music notation. All throughout, it is interspersed with interactive games that make learning fun and easy. The instrument itself has a spruce top with maple back and sides. Other parts are of dyed hardwood with a metal alloy, four tuner tailpiece. The violin has been meticulously set-up and packed in a protective cloth. The bridge is in place, the strings are loosened for shipping. The bow is made of wood, and rosin for the bow is included. The sturdy carrying case has light foam padding as well as a handle and shoulder strap. This pack is perfect for beginners with everything you need to play the violin: a quality, 1/4-size violin with bow and carrying case, plus rosin and cloth. Make sure to see our sizing chart below. If you have any questions about this product by eMedia, contact us by completing and submitting the form below. If you are looking for a specif part number, please include it with your message.